Home / News / Sexism row after school put boy into isolation for wearing earrings as mum says "they're not just for girls"
Sexism row after school put boy into isolation for wearing earrings as mum says "they're not just for girls"
A furious mum has accused a school of sexism after her son was taken out of his class and placed in isolation for wearing a pair of stud earrings. Callum Nisbett was told he had to take his small stud earrings out when he arrived for class at St Peter's Catholic School in Solihull - even though they were the same size and style that are allowed for girls at the school. The 15-year-old said he was told he could not wear the earrings "because he was a boy", reports Birmingham Live . When Callum and his mum refused, the teen was put into isolation and told he could only return to class after he'd taken out the earrings. His mum Sharon Richards, of Marston Green, said: "Earrings are not just for girls - allowing only girls to wear them is sexist!" "It's wrong. My daughter had the same earrings and was never told to take them out. "I spoke to the assistant head teacher who told me it's not because they're the wrong earrings, but just because he's a boy. "I said 'can you hear yourself?' He said it's school policy. "I've checked the school policy and it says girls can wear gold studs but it doesn't say boys can't. "I am absolutely fuming and astounded at the fact a secondary school in this age does not recognise gender equality. "I have been told that I am free to complain but until then he will be placed in isolation and ultimately may be excluded from school." Callum has just started Year 11 and his mum is concerned he might fall behind in his GCSE work as a result of being isolated from his peers and only being set worksheets by his teachers rather than attending actual lessons. But she's adamant that the school's policy is wrong. "I was told I needed to be responsible as being put into isolation he could miss out on his GCSE work," said the mum-of-two, who works as a school teacher. "I said so you mean he could fail his GCSEs if he doesn't take out his earrings? And the assistant head said yes. "In this day and age, it beggar's belief. "Both of my children attend St Peter's and they are fully compliant with the school uniform always. 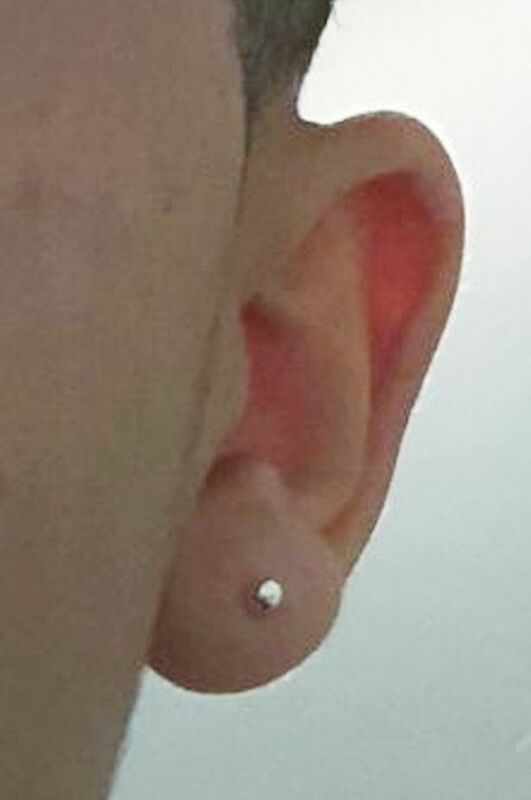 "To be told that during his most important year of school, my son will fail his exams because he has chosen to wear ‘school compliant’ earrings is absolutely out of order and a complete disregard for his education." Ms Richards says both girls and boys are allowed to wear earrings at the school where she works. "This has been going on for two weeks, since he went back to school after the summer holidays," she said. "We made sure they were the correct size for school. "Callum just wants to leave them in and rightly so. "I've told him he may have to take them out whilst we sort this out because I am responsible enough to know what will happen if he misses his lessons. "But this is sexist, it's in the Equality Act. They're doing PSHE lessons at school about it at the moment. "I've been told that if I take this to the governors, the school is likely to ban boys and girls from wearing earrings to school." Callum was threatened with isolation at the end of last week. Today he went into school wearing just one tiny stud, which he offered to cover with a plaster. His teachers put him in isolation but after BirminghamLive got in touch, he was allowed back into his class. Mrs Marie Murphy, headteacher at St Peter’s Catholic School, said: "Our policy regarding the wearing of stud earrings will be reviewed by our governing body in light of the recent occurrence and the pupil concerned is now back in class."